I always have a notebook with me to sketch out ideas as they hit me. And, of course, there's my large sketchbook, notepad and smaller sketch book, along with many other notebooks around the house! The sad thing is, I don't usually get to many of these ideas. The reason? Frankly, I think I'm afraid to try new things lest I fail. I've wanted to make fiber/fabric jewelry for the longest time - even have a picture in my mind of exactly how I would do it, but there's that fear! I'd love to try dolls, scarves, paper ornaments, etc, but never seem to get to them, although I could make the time if I wanted to. I really admire people like Terri and Gayle (and others) who continually produce new work and, in Terri's case, even write books! "Kristy, I have some news for you! We won a giveaway over at our friend Quiltcat's blog!! It's a hand made cat mat with catnip inside!! I can see you're very excited!!" "Ok, let me investigate. Hmmm... soft, just the right size for me, cute kitty fabric - let's give it a try..."
"Ooooo- Mom added a pillow under it! I think I love it! Thank you, Quiltcat, and all your helpers - Sylvie, Louie, Fuzzy and Gingy! My husband and I returned today from a road trip to Toronto. Our daughter Kate was hit by a car while riding her bike and broke her elbow, so we went to see her and to offer support. She also just began a new job, so she has a lot to contend with right now. On our return trip, we saw little tiny bits of color in the foliage along the NY Thruway. In another few weeks the trees should be glorious in their fall finery. While visiting in Toronto, we went to a wonderful store called The Paper Place. There we found an abundance of beautiful papers from Japan and around the world. Of course, Kate and I just had to buy some! You can see and/or order papers from them by clicking on the link. 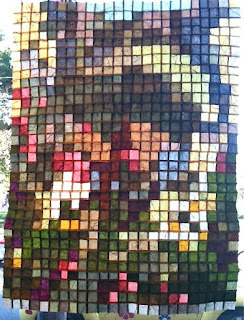 Displayed in the window of the shop was this beautiful paper quilt called 'Garden 2009' by Judith Rudoler.It was carefully stitched, and the colors of the semi-transparent papers fairly glowed in the sunlight. This is the back of the quilt, taken from the inside of the store. Tomorrow I hope to get back to making fabric paper! Here's a shout-out to Kate: Hope you're feeling better, Hon! 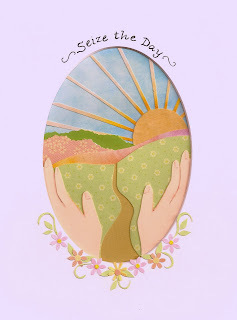 Today I was delighted to find out that some of my papercuts were featured on Lori Portka's blog, Finding Happiness Through Art. 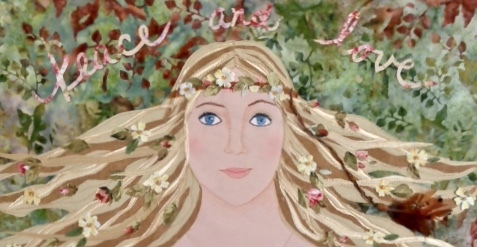 Lori creates very inspiring paintings which she shares on her blog with hopes of "spreading a little happiness in the world." In addition to her own artwork, she regularly features the work of other artists whose work reflects a spirit of joy and positivity. Thank you so much, Lori, for including my pictures! I'm honored! Did you ever hear of fabric paper? I first read about it in Terri Stegmiller's book, Creative Paper Quilts, and decided to give it a try. I actually followed directions by Fannie Narte which I found here. The process starts with a piece of muslin which is coated with a mixture of white glue and water. Threads and pieces of fabric and colored tissue are pressed into the glue, then the muslin is covered with a sheet of white tissue which has been crumpled up and then spread out. The entire piece is then coated with more of the white glue mixture. This is as far as I've come so far! My next step is to add some paint. 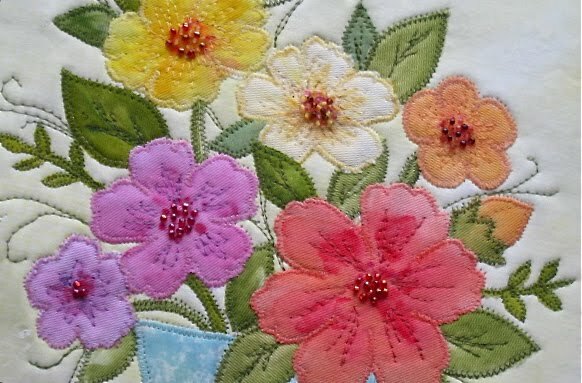 When these pieces are completed they can be stitched and embellished. I plan to use them as backgrounds for pictures. I like the texture that can be achieved, and this paper can be sewn without ripping! Tomorrow I plan to sponge on some paint, then stitch it when it's dry. I'll let you know what comes of it! Here are two ATCs exchanged between my friend Janice and me. Janice's (top) has a real starfish on it, making it a bit difficult to scan, but I love the cut-outs, the fish stamps and the whole effect of it being "Underwater", the title. 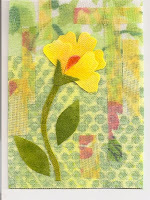 Mine is made with fused, hand painted fabric scraps, and after scanning it I added the word "joyful" to it. This is Janice's birthday weekend coming up, and I made a cut paper card for her which she has already received, so I've posted it on my other blog, Paper Perks. What beautiful weather we've been having! Cool, sunny, breezy - to me, perfect!! 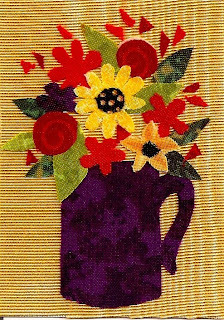 It inspired me to felt and embellish this little piece, using beads and trims and some of the wool roving I've been collecting. Fun to do and I feel inspired to do more of this in the future. Hope everyone has enjoyed a lovely Labor Day weekend! Remember "Early Release" days in school? I feel as happy as I did back then. I am back home, having received an early release from the hospital. I was originally told I'd be there until after Labor Day, so this was good news indeed! To all of you who left encouraging comments, thank you, thank you for all of your good wishes!! Perhaps I shouldn't be sharing my personal woes on this blog, but this problem with my leg has tipped me sideways and I very much appreciate the support of my blogging friends. Right now, I'm sitting on my porch with legs propped up on pillows, loving the sunshine and the breeze from the ceiling fan, and so glad to be back in familiar surroundings. Here's hoping that everyone is enjoying a great weekend! I'm going back into the hospital for another 'vacation', so I'll be out of touch for a few days. Ahhh, perfect! The room is mine once again!!" Kristy's take on having been shut out of the guest room while we had visitors recently!!! From my last blog post, I can see that just about everyone has times when they are 'stuck' creatively! I appreciate all the input and ideas as to how to let go and just play with materials and be creative. Above is a little sneak peek at what I am working on currently. Unfortunately, my leg is acting up again and I must keep it elevated, so that limits the amount of time I can spend in the studio. But I do sneak in there a few times a day for a few minutes to do a tiny bit. Hope everyone is having a great week. We are having gorgeous weather here in New England and I am thoroughly enjoying it on my porch!